Melanie Mununggurr-Williams, 2018 Australian Poetry Slam Champion, performing at the National Final at Sydney Opera House. 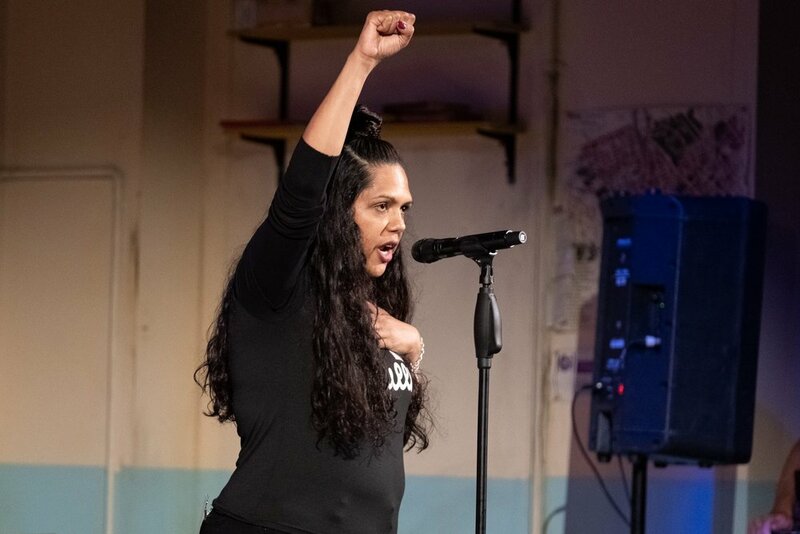 Melanie Mununggurr-Williams was crowned the first ever Indigenous champion of the Australian Poetry Slam in 2018. The Northern Territory poet claimed the title at the National Final as part of Story-Fest ‘18. Watch her performance at Sydney Opera House on October 21st. Solli Raphael was crowned the first ever Youth Champion of the Australian Poetry Slam in 2017. The 12-year-old Coffs Harbour poet claimed the title in a tie-breaking round against Adult Champion Jesse Oliver. Watch Solli's incredible performance in front of a sold-out crowd at Sydney Opera House on 15 October 2017. Solli Raphael, 2017 Australian Poetry Slam Champion — Youth, performing at the National Final at Sydney Opera House. Jesse Oliver, 2017 Australian Poetry Slam Champion — Adult, performing at the National Final at Sydney Opera House. Jesse Oliver is the Australian Poetry Slam Adult Champion for 2017. The wholesome Perth Poet is best known for his casual conversational style of slam. Watch his performance from the 2017 National Final. Arielle Cottingham, 2016 Australian Poetry Slam Champion, performing at the National Final at Sydney Opera House. Arielle Cottingham was the Australian Poetry Slam Champion for 2016. Known for mixing the personal and the political, her work deals heavily with themes of identity, heritage and history. Watch her powerful performance at the Sydney Opera House for the National Final. Philip Wilcox, 2015 Australian Poetry Slam Champion, performing at the National Final at Sydney Opera House. Philip Wilcox was the Australian Poetry Slam Champion for 2015, and previous two-time NSW Poetry Slam Champion. Using wit, humour and raw authenticity, Philip’s work is at times both hilarious and challenging. Watch Phil’s winning performance for the National Final. Zohab Zee Khan, 2014 Australian Poetry Slam Champion, performing at the National Final at Sydney Opera House. Zohab Zee Khan was the Australian Poetry Slam Champion for 2014. Part spoken word artist, motivational speaker and hip-hop artist, Zohab’s work empowers and educates through discussions of racism, identity and socio-economic issues. Watch his performance on the power of spoken word at the National Final. Jesse John Brand, 2013 Australian Poetry Slam Champion, at the National Final. Jesse John Brand was the Australian Poetry Slam Champion for 2013. Using experimental performance methods, his work explores personal narratives and themes of modern dystopia, history, science and religion. Watch Jesse’s performance at the National Final. CJ Bowerbird, 2012 Australian Poetry Slam Champion, performing at the National Final. CJ Bowerbird was the Australian Poetry Slam Champion for 2012. Exploring everyday issues and what it means to be human, CJ’s classic satire and wit make his work both poignant and hilarious. Watch CJ's performance at the Sydney Opera House for the National Final. Luka Lesson, 2011 Australian Poetry Slam Champion, performing at the National Final. Luka Lesson was the Australian Poetry Slam Champion for 2011. Using poetry to empower communities and bring attention to critical social issues, Luka remains a significant force in the global spoken word community. Watch his winning performance at the National Final. 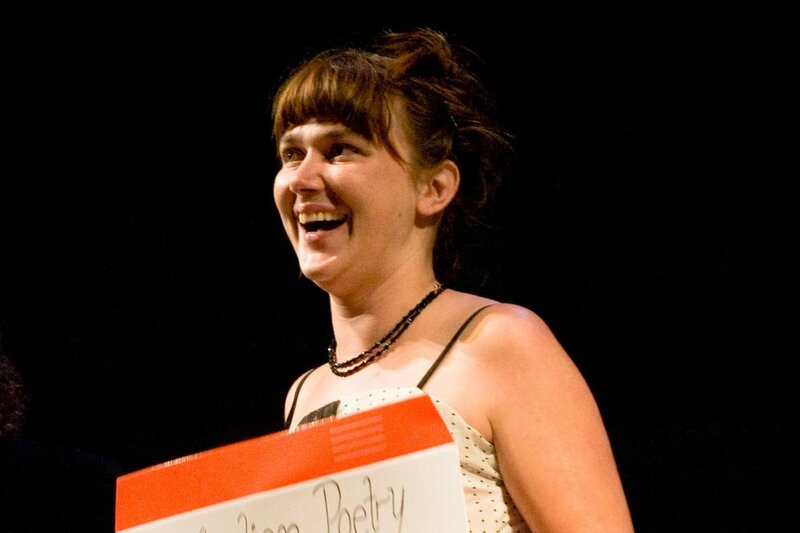 Kelly-Lee Hickey, 2010 Australian Poetry Slam Champion. Kelly-Lee Hickey was the Australian Poetry Slam Champion for 2010. Kelly-Lee’s work deals with the deeply personal intersections of identity, location and history, often using storytelling to connect communities throughout Australia and Indonesia. Watch her performance at the National Final. Sarah Taylor, 2009 Australian Poetry Slam Champion. Sarah Taylor was the Australian Poetry Slam Champion for 2009. Coming to spoken word poetry by chance, Sarah’s winning slam uses a deep sense of humour to investigate the taboos and shocks of aging in women. Watch her performance at the National Final. Omar Musa, 2008 Australian Poetry Slam Champion. Omar Musa was the 2008 Australian Poetry Slam Champion. Confronting the dark realities of Australian history and culture, in his winning slam Omar began to investigate traditional understandings of masculinity and family life. Watch his performance at the Sydney Opera House for the National Final.